Getting used to dentures may seem daunting at first, but after a little practice, using and caring for your dentures will seem like second nature. Whether you use adhesives to hold your upper, lower, or both sets of dentures in place is purely a personal choice. If you do use denture adhesives, learning to remove your dentures is one of the denture-wearing skills you’ll quickly master with just a little practice. Within a week you’ll be a seasoned pro. If the denture adhesive is insoluble in water, how can the denture be removed? The Polyvinylacetate is the adhesive. It works only on a dry surface. To keep the jaw dry, we use Carboxymethylcellulose (CMC). CMC works like a sponge–it absorbs saliva. If the sponge “is filled” with saliva and no more saliva can be absorbed, the jaw becomes wet, the Polyvinylacetate loses contact with the jaw and the denture stays in place only by suction. The consumer can remove the dentures. All the residues of the adhesive will remain on the dentures. No adhesive is left on the gum. The residues of the adhesive can easily be removed by using cleansing tablets. For the upper denture, removal may be more difficult due to more surface area. Slide your fingers or thumbs, whichever is more comfortable, in between the upper dentures and your cheek on either side. Press down gently on the upper portion of the dentures, where they meet your gums, until the adhesive seal is loosened and the dentures come out of your mouth easily. 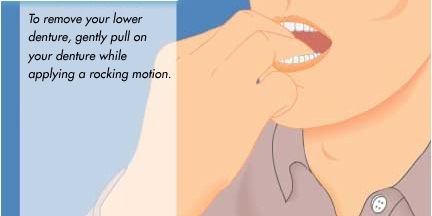 Try to press down with even pressure, although you can apply slightly more pressure to first one side, then the other, if necessary, to loosen the dentures. 3. Grip the lower dentures between your thumb and forefingers on either side, then slowly pull them out as you gently rock the dentures from side to side to loosen them. You can expect the lower dentures to usually come out more easily than the upper. 4. Moisten a washcloth with warm water. 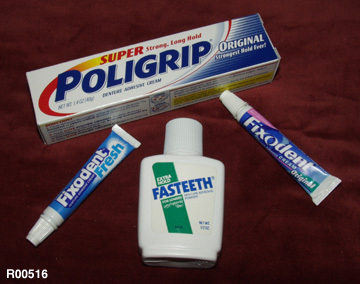 Rub the cloth over your gums to remove stuck-on denture adhesive. Wet your toothbrush, add a pea-size amount of toothpaste and brush your gums to clean off remaining denture adhesive. It is important to clean and brush your gums daily to maintain good dental health. Can the denture be removed before the saturation point is reached? Normally, there would be no need to remove the denture since no food particles get trapped underneath. However, specific cases–like accidents–the dentures can be removed by a little force. It will be a painless procedure and will cause no negative effects, but residues might be left on the gum. These residues are not harmful and will come off by themselves after a few hours. Under no circumstances should denture cleansers or other removal methods be used to clean the gum. REMOVERS – There are professional removers that you can purchase. Most of them are very similar and work well. Read the directions carefully and use the denture adhesive removers exactly the way that the manufacturer suggests. HOT WATER – Hot items usually loosen up dentures. Use hot water to loosen up the adhesive on your dentures. Fill a small cup with warm water, and swish the water around in your mouth. This tacky glue like substance will warm up and come off easily. If the adhesive is in your mouth, you may not want to use this removal technique. If you do use hot water in your mouth to remove the adhesive make sure that the water is not so hot that it will burn you. This is a great way to remove adhesives from your dentures once they are out of your mouth. COLD WATER – Cold water may be an easier way to remove the adhesive off of your dentures or mouth. Take cold water or ice cubes and put them in your mouth. This will freeze the adhesive and allow you to remove it easily. LESS ADHESIVES – You can also start using less adhesive if this is becoming a problem for you. Some people find that changing the type of adhesive is also helpful. Try using a powdered adhesive in a very small amount so that excess adhesive does not get stuck in the inside of your mouth. This is the best method to avoid having to remove adhesives from your dentures. 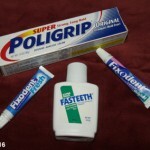 Dentures adhesive: Do you need them? This entry was posted in Cleaning Dentures, Denture, Denture Cares, Uncategorized and tagged adhesive seal, denture adhesive, dentures, fingers, gums, lower denture, remove, thumbs, upper denture on October 17, 2011 by chzechze.